While the Trump administration outwardly vocalizes against illegal immigration, it has also effectively developed, and continues to develop, hurdles to curb legal immigration under the H-1B visa program. Its hardline immigration stance has resulted in the unprecedented increase in scrutiny of H-1B petitions and thereby created hurdles for U.S. employers, foreign national workers, and legal practitioners. The H-1B visa program allots temporary H-1B visas to foreign workers, generally with bachelor's degrees or higher, with specialized skills to work for 3 years at a time, often in the science, technology, and engineering sectors. The H-1B visas are awarded by an annual lottery system and the demand has vastly outstripped supply. U.S. Citizenship and Immigration Services (USCIS) grants 85,000 such visas annually — 65,000 go to foreign workers who possess at least a bachelor's degree or equivalent, and an additional 20,000 for those who have earned a master's degree or higher in the U.S. Critics who continually attack the H-1B visa program argue that it drives down wages as companies use it to displace American workers to hire cheap, foreign workers in place of Americans. On the other side, proponents say the program provides much-needed skilled, innovative, and creative workers to sectors where companies have struggled to hire qualified Americans. Silicon Valley companies in particular have been vocal proponents of the program, with IBM, Microsoft, Amazon, Google, and Apple ranking among the top 20 with the most H-1B visa approvals. However, even with the huge benefit of advancing our economy and remaining competitive in the global marketplace, the Trump administration is systematically making it increasingly difficult for companies to hire foreign workers through a combination of rulemaking, policy memos, and operational changes. The H-1B visa program plays a role in combating labor shortages by giving employers located in areas that have a labor shortage opportunities to hire professionals from overseas to fill specialty positions. This includes teachers in rural school districts that have a labor shortage and may not have access to qualified U.S. workers who are willing to relocate permanently. Also, H-1B employees strengthen our global competitiveness by fueling innovation and job creation. A study released by the Harvard Business School found that immigrants accounted for 67% increase in the U.S. science and engineering workforce between 1995 and 2006. In an another study, released by the National Foundation for American Policy, there is a positive and significant association between the number of H-1B positions by employers and the change in total employment one year later. The unprecedented scrutiny of the H-1B visa program stems from President Trump’s “Buy American, Hire American” (BAHA) Executive Order. Its stated purpose is to protect the economic interests of American workers by rigorously enforcing and administering the laws governing the entry of foreign workers. BAHA singled out the H-1B visa program and directed the Department of Homeland Security (DHS), in coordination with other agencies, to advance policies to help ensure H-1B visas are awarded to the “most-skilled or highest-paid beneficiaries” and to conduct a “thorough review” of the employment visa programs. The Department of State (DOS) made changes to its Foreign Affairs Manual (FAM), and the Department of Labor (DOL) and Department of Justice (DOJ) have stepped up monitoring and enforcement of H-1B employers. Rescission of the Computer Programmer Memo: In a memo released in March 2017, USCIS rescinded a guidance from 2000 that recognized computer programmers as qualifying for a “specialty occupation” under the H-1B visa program. The memo also directed H-1B adjudicators to review the certified Labor Condition Application (LCA) and cautioned that a Level I wage associated with an entry-level position “will likely contradict a claim that the proffered position is particularly complex, specialized, or unique compared to other positions within the same occupation.” Because this memo was released after the FY2018 H-1B cap filing window, H-1B employers were bombarded with Requests for Evidence (RFEs), questioning the wages listed on the certified LCAs and whether the proffered positions are “specialty occupations.” RFEs challenge the basis of the petitions and assert that the employers do not qualify for the visas, and requests for further evidence. Between Jan. 1 and Aug. 31 last year, the total number of H-1B petitions rose by less than 3 percent compared to the year earlier, but USCIS issued 85,000 RFEs to H-1B visa petitions - a 45 percent increase. Rescission of the 2004 “Deference” Policy: In a directive released October 2017, USCIS rescinded a policy from 2004 that instructed officers to give deference to prior determinations when adjudicating nonimmigrant employment-based extension petitions involving the same position and the same employer. The new policy instructed officers to apply the same level of scrutiny to both initial petitions and extension requests even where the underlying facts are unchanged from a previously approved petition. Therefore, an H-1B worker may have been filling a position for three years, but as a result of this new policy, even though there is no change in employer or position, an identical, previously approved petition does not guarantee approval. Suspension of the Interview Waiver Program (IWP): In 2012, the DOS implemented the IWP to meet increasing demand and streamline the visa process given limited resources and to promote travel and tourism to the U.S. as important drivers of job creation and economic growth. However, on March 2017, the Trump administration suspended the IWP, thereby requiring all employment-based green card applicants to attend an in-person USCIS interview. This creates a significant burden on consular posts as it demands further exhaustion of their scarce resources. Termination of the H-4 Employment Authorization Document (EAD) program: In 2015, the Obama administration created regulations permitting H-4 spouses of H-1B non-immigrant workers to apply for employment authorization while the H-1B worker waits for his or her green card application to be approved. 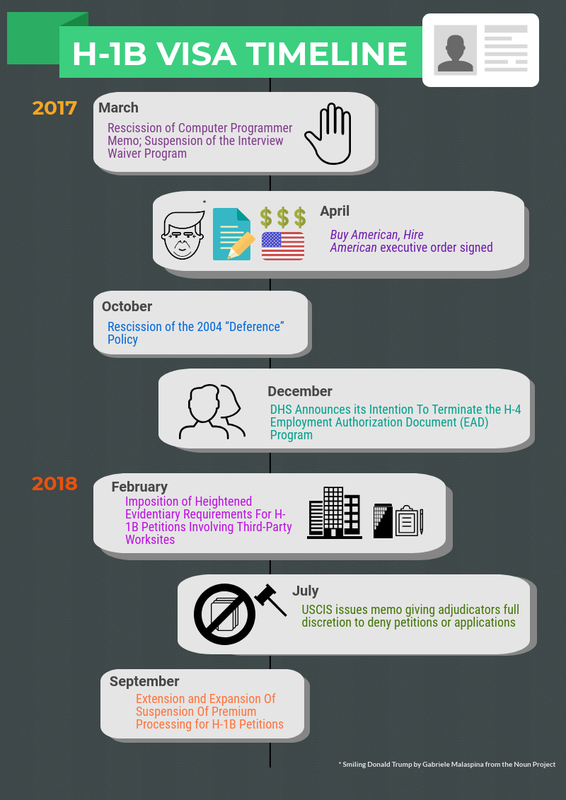 Although work- authorized H-4 spouses are making important contributions to the U.S. economy, DHS announced in 2017 its intent to terminate the H-4 EAD program. The elimination of H-4 work authorization would impede family integration and place economic burdens on H-1B families. It would also serve as a deterrence for some H-1B workers to continue employment if their spouse are not eligible to work. Imposition of Heightened Evidentiary Requirements for H-1B Petitions Involving Third-Party Worksites: In a memo released February 2018, because of the assumption of fraud and abuse that has been associated with third-party worksite cases, where the H-1B worker is placed at a location other than the employer’s worksite. USCIS imposed more burdensome evidentiary requirements. These applied not only to the employers, but also to the third-party companies by requiring from them contracts, work orders, itineraries, and detailed letters from authorized company representatives attesting to the nature and duration of the project for which H-1B workers are required, despite even though the third-party company not being is not the employer. More recently, USCIS issued stricter updated guidelines that made the denial of petitions and the placing of H-1B workers in removal proceedings easier. On June 28, 2018, USCIS announced that it will place an H-1B worker in removal (deportation) proceedings even while the worker is challenging a denial. On July 13, 2018, USCIS issued a memo that gives adjudicators full discretion to deny petitions or applications on the basis that “initial evidence” was not submitted without first issuing an RFE, yet the agency offered no guidance to adjudicators on how to apply the policy. Undoubtedly, the number of RFEs and denials of H-1B applications and extensions will continue to rise. In addition, targeted site visits and random suspensions of expedited processing for H-1B visas are frequent, further disrupting U.S. business operations. The H-1B hurdles curbing legal immigration formed quickly but more will inevitably come as the Administration’s agenda include further regulatory actions and proposals. The Trump administration’s specific policy changes have resulted in hardships for all those involved. Many voice their concerns about the increased cost and delays in H-1B visa. One example is the American Medical Association’s (AMA) letter to USCIS on behalf of its physician and medical students. Moreover, the heightened standards and new interpretations have a chilling effect on U.S. employers as they cause significant unpredictability. The new policies have already greatly reduced the number of H-1B petitions received. As expressed in a letter signed by a group of CEOs of top U.S. companies including Apple Inc.’s Tim Cook and JPMorgan Chase & Co.’s Jamie Dimon, the Trump administration’s immigration policy changes increases uncertainty, raises “serious concerns,” and undermine economic growth as the policy shifts are “unfair” and create a risk of “unnecessary costs and complications.” The mounting frustration over the Trump administration’s policies have also sparked the formation of a litigation task force by the American Immigration Lawyers Association (AILA), as stated by Chairman Klasko, that will initiate impact litigation on many recent immigration issues. It has been a year since I started practicing as a business immigration attorney. Business immigration law is highly technical and sophisticated. Within the year of my practice so far, many changes like those detailed above have taken place. As our duty, business immigration attorneys must keep abreast of these changes in order to ensure that client questions are addressed and work is completed in a timely and efficient manner. These changes have significant impact on how our clients operate their businesses. Because I started practicing business immigration during the surge of RFEs, most of my knowledge on H-1Bs stems from drafting numerous responses to RFEs. The most common RFE requests I have successfully responded to include: wage level 1, specialty occupation, maintenance of status, beneficiary qualifications, and employee-employer relationship. By being exposed to the various ways USCIS questions H-1B petitions in the RFEs, I became highly familiar with the nuances and types of documentation required of H-1B petitions. Even more so, nowadays, putting together and submitting H-1B petitions becomes a focused practice of avoiding an RFE, one that requires even more paramount preparation and strategizing. All parties must be made aware of the increased scrutiny. Employers must prepare for potential setbacks and/or alternate arrangements in the event of an unfavorable outcome. Unfortunately, RFEs are unpredictable regardless whether an H-1B petition seems surely approvable. Additional resources must be sought like never before. Rachelle is a business immigration attorney. She aims to promote and advocate for fair and reasonable immigration law and policy. She is a graduate of the University of California, Berkeley and the University of California, Hastings College of the Law where she was recognized for her Outstanding Pro Bono work. Her past experience includes serving the UC Hastings Refugee & Human Rights Clinic, Legal Aid Society – Employment Law Center’s Workers’ Rights Clinic, and Asian Pacific Islander Legal Outreach. She enjoys photography and fitness, and exploring and learning. She is a proponent of positive thinking and personal growth/development. Dec 9 Open Call, Happy Holidays, and Thank You!